ApiHawk Billia is a software sure to provide its users with the most customizable options for technical and business management possible. But we don’t stop with what’s just possible, we help visions become reality! We introduce the Billa Cloud Integration. The Cloud service that makes the creation and maintenance of data centers and virtual machines as easy as saying “customize”. We are all familiar with what a Cloud does, how it operates, and how limiting at the same time it can be. Have you ever found yourself in a situation where you need to implement Cloud computing to your business, but either the payment options were unsuitable, you were unable to have more than one virtual machine, or the notification system was virtually nonexistent? Then this article is for you and Billia Cloud Integration is the answer to your problem. We faced the same difficulties, our clients did too. So for a long time we went through intense brainstorming sessions to see how we can improve the situation. We wanted to implement the Cloud in a way that suited both the technical engineers and the businesses using the service. We needed to find that perfect golden mean that would keep both sides happy. What is Billia Cloud Integration? Billia Cloud Integration currently uses the Cloud platform OnApp. In other variations it can be set to work with different Cloud platforms, as well. Still, all the maintenance and control over the Cloud, which includes its payment options, pricing process, notifications, to list a few, are managed by the Billia engine. This service implementation enables the purchase of a Cloud on price per hour base. It provides not just a simple virtual machine, but an entire data center, which can handle multiple such instances. These are just some of its many unique features. The Billia Cloud Integration provides more functionalities and flexibility to its users in the perfect way. It takes the best out of the technical application of a Cloud service and implements it alongside specific business preferences. This way such a service becomes easier to sell, manage, and control. Some of the generic Cloud problems we faced included factors that were impossible to overcome or redesign. These included: a nonexistent multi data center availability and support, limited payment options, no credit limits, impossibility for collection of overdue payments, and no adequate notification process. None of these could be simply adjusted into Cloud computing systems, as they operate on globally accepted standards. The answer to this dilemma were Billia’s integration capabilities. 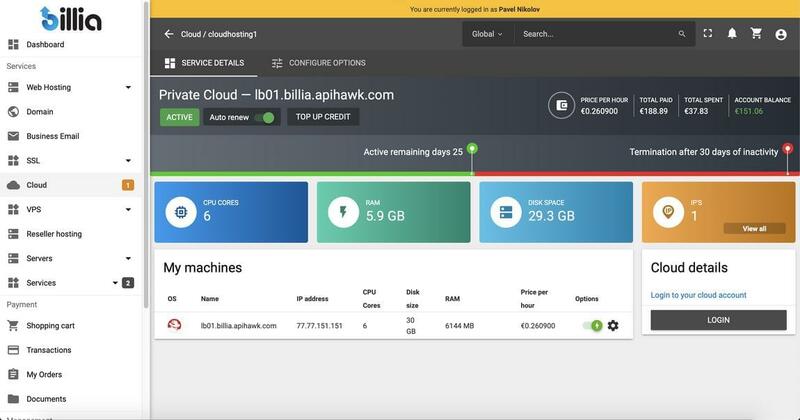 With the help of ApiHawk AppCell we integrated the OnApp Cloud to provide the platform itself, and set Billia to control everything else, which till now was impossible to accomplish! Why have only one virtual machine when you can have many? The Billia Cloud Integration creates an entire data center for the purchaser. This Data Center has the capability to contain multiple virtual instances, as many as the Cloud configuration can take. Moreover, one user can manage multiple data centers at the same time. Set your Cloud to have the specifications you want and need. Choose your OS, CPU, RAM, location, and capacity space, and change them any time you need to. The entire Billia Cloud Integration is designed as a billable system that charges per the hour. This way any customer has the opportunity to purchase a data center for a specific amount of time. Once the service is purchased it starts working with the amount paid for it. Additionally, thanks to Billia’s Payment Gateway component, customers have the opportunity to pay through various payment methods, which include more than 70 supported vendors. The Billia Cloud Integration is also not bound to one single Billing. The payments can be made by any single company listed in the customer’s account, no matter if the payment is online or offline. Example: Since Billia users can have additional profiles in their accounts, you can select any of those profiles to deposit a new payment to a Cloud. This affects the name, contact and payment details that would appear on that payment invoice. We wanted to provide the Business with the time and opportunity to be flexible with their data centers. So we designed Billia to recalculate prices and operating time depending on the state of each Cloud. In the case a change has been made to the Cloud configuration, e.g. scaling up the specifications, the system will on that second recalculate the price per hour and the remaining active time of the Cloud depending on its current available funds. Example: Let’s say a Cloud that has 2GB of RAM and 4GB of HDD space costs $0.065789 per hour. You deposit $5 to the Cloud which will keep it active for 76 hours. If you decide to modify the specifications and give the Cloud 10GB of HDD space, the price per hour will go up, hence the $5 will keep the Cloud active for less than 76 hours. If a Cloud ends up with depleted funds, the system will then continue its operational time depending on the amount available in the user’s Billia Wallet. This is a sort of “bank guarantee”. At the same time, that amount is only used as a point of reference in order for the system to know for how many more hours it can continue maintaining the Cloud’s active time. The data center at that point will be operating with amount on negative balance. If a user has multi data centers with depleted funds, Billia will calculate the user’s Wallet amount proportionally between these data centers depending on their size. The larger the Claud, the more additional active time it will get. Example: Imagine you have two data centers, one of which is five times bigger than the other. If your Wallet has $600 credit/balance, both Clouds will be recalculated based on their ratio and will respectively be assigned working time equal to $100 and $500. This will guarantee almost similar additional active time. The beauty of the Billia engine lays also in the trust and communication that it instigates between Admin and User. If suitable, an Admin at any point can deposit a credit amount to the User’s Wallet, to prevent situations where their Cloud may stop working. This means that the user will continue to operate with their Cloud on “borrowed funds”. After this, the user is legally obliged to return that amount, otherwise they risk a suspension on their Cloud, termination, and even an OnHold state on their Billia user account. This process helps the user and at the same protects the Billia Admin and their business. Example: Imagine your Cloud is about to deplete all of its funds, your Wallet is empty, and you can’t afford the data center to stop working. You can’t afford to pay any amount just yet so you get in contact with the Admin and they deposit e.g. $200 to your Wallet Credit. When the Cloud has no more funds to work with, the system performs a check on your Wallet balance, sees that you have a credit of $200, so it continues to keep the Cloud active for that exact amount, without actually spending it. The Cloud then has a balance of -$200, which you are legally obliged to return to the Admin, i.e. actually deposit them to your Billia Wallet. In many cases where the user hasn’t deposited a new payment amount in the Cloud, or their Wallet is empty during the system check, it will get suspended to protect the user’s progress and Cloud data. It stops working at that point, but is still accessible and could be activated again with a new payment deposit. The Suspended state usually lasts for 30 days although it could depend on the specific business configuration. Additionally, the user can at any moment terminate the Cloud service, if they choose to do so. Because the Business preference for a Cloud may also include to be able to freely terminate it at any time. A termination of the Cloud service after the system has granted bank guarantee, will involve the customer to submit a Cancel query, which will be in the amount of the Cloud’s negative balance. Any customer has the right to receive updates on their own business. So Billia makes sure to periodically notify its users regarding their Cloud Integration service, e.g. if it is about to be depleted of funds, if it is in risk of being suspended, if it is about to be terminated, etc. We developed Billia Cloud Integration to help the Business operate with the service in the desired and most flexible way possible. All of the processes have been engineered to make the everyday work easier and less restricting. The Billia Cloud Integration service uses a stable Cloud platform as a base and adds the Billia functionality to it. Selling the Billia Cloud Integration service is easy as it provides exactly what any Cloud purchaser wants - a multifunctional data center with none of the Cloud related problems.